Only $1 -- ORDER/DOWNLOAD HERE! This story is about an amazing and delightful adventures of a boy, a safe and caring dragon, and the people of Randee. This boy is not as successful and liked as his brother. But he loves to sing, even though others think he sings poorly. A massive dragon loves his singing, and the boy is vindicated and befriended by this mystical dragon. 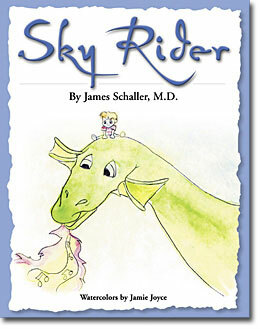 Sky Rider offers an exceptional uplifting happy ending. 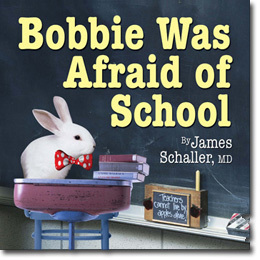 Bobbie was afraid of school. But this book shows you how he went from being scared of school and scared of a bully, to finding out that adults can help kids. Bullies are not in charge of the world. Written by the prolific and creative child and adolescent child psychiatrist, James Schaller MD, these have a strong message meant to leave a child feeling comforted and smiling, at the same time addressing feelings of loneliness, feeling marginalized and harassed. If you child is not feeling these things, these help develop character and kindness, and help them become more sensitive to others. A skill that will only help them be more successful and intimate with others. So you get a picture book written by a top-flight child development expert. Each book has unique and lovely artistic work done by a local respected artist or a NYC cover expert. All the books are fun, playful and enjoyable. You do not have to drive to the store, but can download them now in seconds. If they get stained or torn, no loss, they are only a dollar! Each story is meant to comfort and empower a child with hope and happiness.